Apparently the Marlins are trying to move 2003 World Series hero Josh Beckett in an attempt to cut their payroll. The two possible trades would be Josh Beckett and Mike Lowell to the Rangers for Hank Blalock and John Denks, or Peter Gammons suggests he could be sent to the Red Sox for Hanley Ramirez and either Jon Lester or Anibal Sanchez. Josh Beckett has at times been compared to a young Roger Clemens. Unfortunately, much of his young career has been marred with blister problems. In 2005 he pitched in 29 games, the most of his career, and posted a 15-8 record with a 3.37 ERA. How much more can be expected of him? 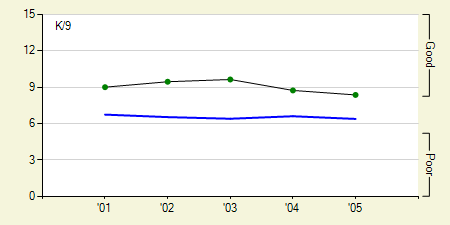 Josh Beckett's strikeouts per 9 innings (K/9) have been on a slight decline the past two years, but it still remains an excellent 8.4. That's good enough to rank him among the top 10 of all starting pitchers in 2005. 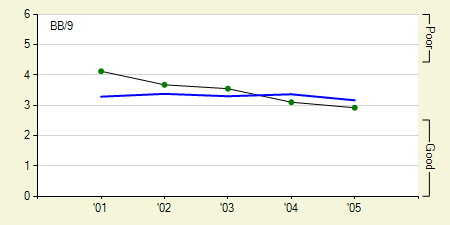 Fortunately, any decrease in his K/9 has been offset by a greater decrease in his walks per 9 innings (BB/9). There is still a lot of room for improvement here and he's heading in the right direction. 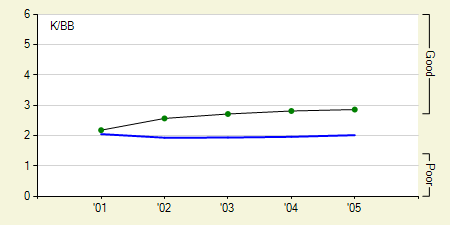 If you take a look at his strikeout to walk ratio (K/BB) graph below, you can see every year he has made slight improvements. Josh Beckett will only be 26 years old next season. The only thing stopping him thus far has been his blisters and he was only bothered by them once last year. Each year of his young career he has taken small steps forward and I expect that next year he'll take yet another step forward. We hoped you liked reading Daily Graphing – Josh Beckett by David Appelman!